Casa Caucaso’s striking geometry makes for an eye-catching family home. This three-storey residential property in Mexico City was created by JJRR Arquitetura for the practice’s own director – Jose Juan Rivera Rio – and his family of five. The carefully crafted design marks a strong contrast between its dynamic, brutalist exterior, and a warm and inviting interior atmosphere. The site’s surrounding nature was key to the design development, with the architects aiming to create strong connections between inside and outside in several parts of the house. Brutalist references also helped mould the exterior’s graphic concrete shapes. This also informed the material selection. A mixed palette of concrete, wood, marble, glass and mirrors was put together after maticulous research. Key criteria also included the material’s proximity to the site and its minimal maintenance requirements. The construction sits on a raised foundation, lifted off the ground level by 1.3m. This gesture secures the best views for residents, offering them a front row seat to the sunsets that stretch over the cityscape and neighbouring mountains. A terrace, which acts as an extension of the living room, provides the ideal spot to take in the long vistas. On the middle level – the house’s main living space – the dramatic double-height entrance lobby neighbours the home’s social spaces, which are oriented centrally and towards the west. The property’s east side contains a double bedroom. Carefully placed openings and views across levels create a sense of openness throughout. Moving up towards the top floor via the stairs, residents are guided to cross a glass panelled bridge, which runs above the large lobby and into the spacious second storey. A wooden screen above it filters light through. This level houses the master bedroom and one more bedroom, each of which is accompanied by a terrace, en-suite bathroom and dressing room. 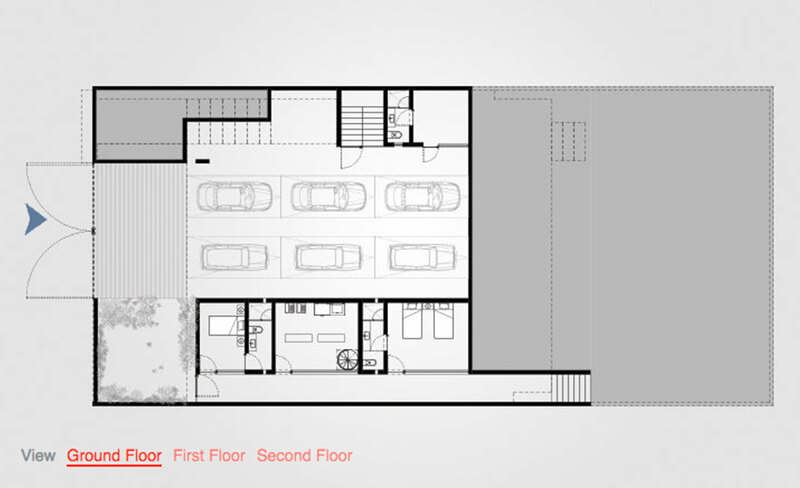 Tucked away in the lower ground floor are the house’s service areas, along with an especially generous garage, with enough space to accommodate up to six cars.